After qualifying as a dental surgeon, Dr Touraj Razavi gained extensive experience in hospital dentistry, working in oral surgery, maxillofacial surgery and restorative dentistry. He gained his Masters of Science Degree in Implant Dentistry from King’s College London. Touraj has had recent research in the field of dental implants published and has received an award for the best clinical case from Guy’s Dental Institute. 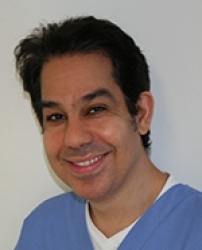 Dr Razavi is an active member of both the Association of Dental Implantology (UK) and the European Association of Osseointegration and he regularly participates in national and international scientific events. Touraj qualified from Cardiff Dental School in 1999. Patients just beginning to think about dental implant treatment may find it helpful to attend a complimentary preliminary consultation with Dr Touraj Razavi. This appointment does not include a clinical examination and it only takes 30 minutes. The discussion will help you consider the options for treating your dental problems and decide whether to proceed to a clinical consultation for implants. The preliminary consultation is free of charge for visitors enquiring through this website. Please use the button in the right hand column to request an appointment. Once you have decided in principle that you want implant treatment, the next step is a clinical consultation. This includes a comprehensive oral examination, and results in the production of a fully-costed individual plan for your treatment. The fee for the clinical assessment appointment and provision of your personal treatment plan is £150. There is an additional charge for X-rays and CT scans. The cost of the treatment planning consultation is refunded when you proceed with the treatment. The practice has a team of general dental practitioners and specialists working together providing high quality, long-lasting treatments using state-of-the art facilities (e.g. CT scan and microscopy), in a wide range of dental specialties such as orthodontics, endodontics, oral radiology, periodontics, oral surgery, sedation and children's dentistry. An itemised estimate is always provided after consultation. Referrals are accepted for all types of dental implant treatment. Once treatment is completed the patient is returned to the referring dentist for ongoing care. Referred patients can receive all their specialist treatments in the same place, making the referral process faster and more convenient. Parrys Lane Dental Practice has been providing high quality dentistry for Bristol and the surrounding area for more than 85 years. The practice ethos is honesty, integrity and quality, offering routine and specialist work, including implant dentistry, in a friendly and professional manner.